Though the City of El Mirage in central Arizona is in a desert and it doesn’t rain often, when it does, parts of the town can quickly become flooded. For this reason, the city has constructed a system of canals and flood basins to protect residences from flood damage. 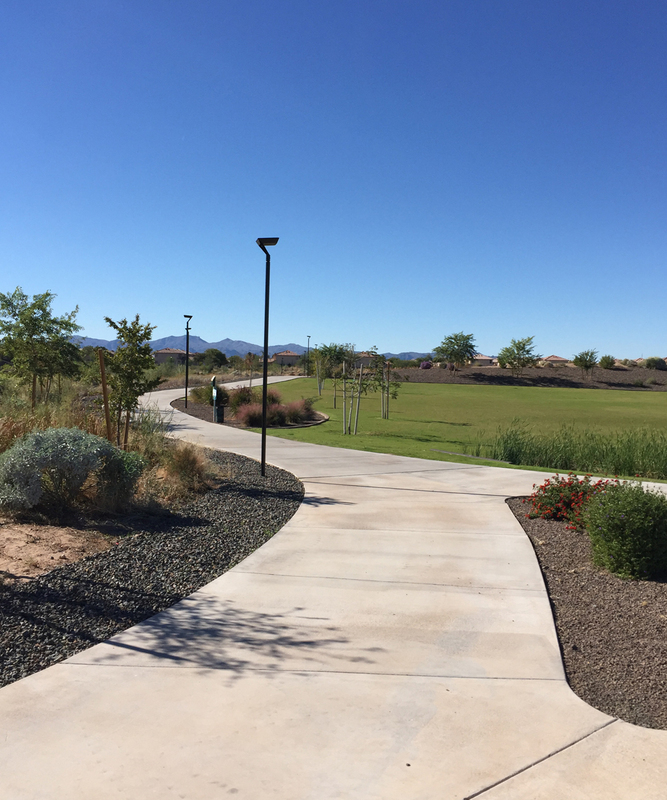 The 28-acre space was transformed into multi-use recreation park that quickly became popular with all demographics, including dog walkers, runners and families. 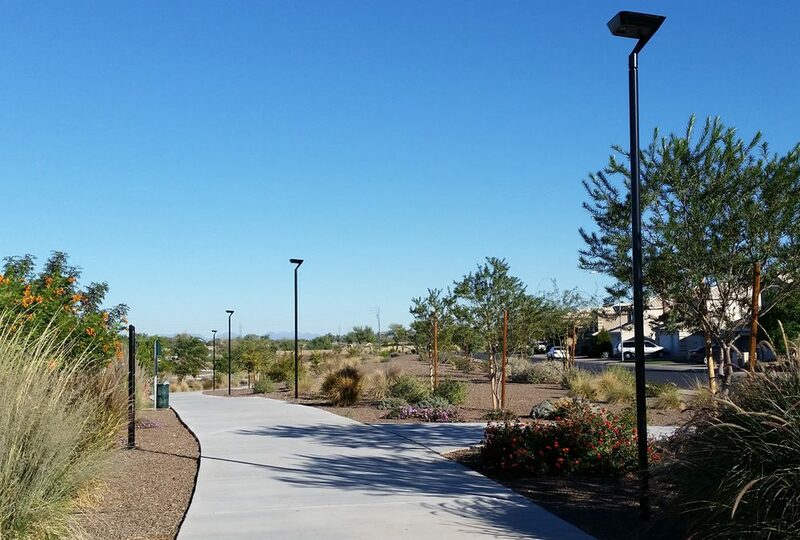 But as the El Mirage Basin Park quickly turned into a community hub and recreation staple for many residents, the city faced a challenge as it did not complete the site with lighting. 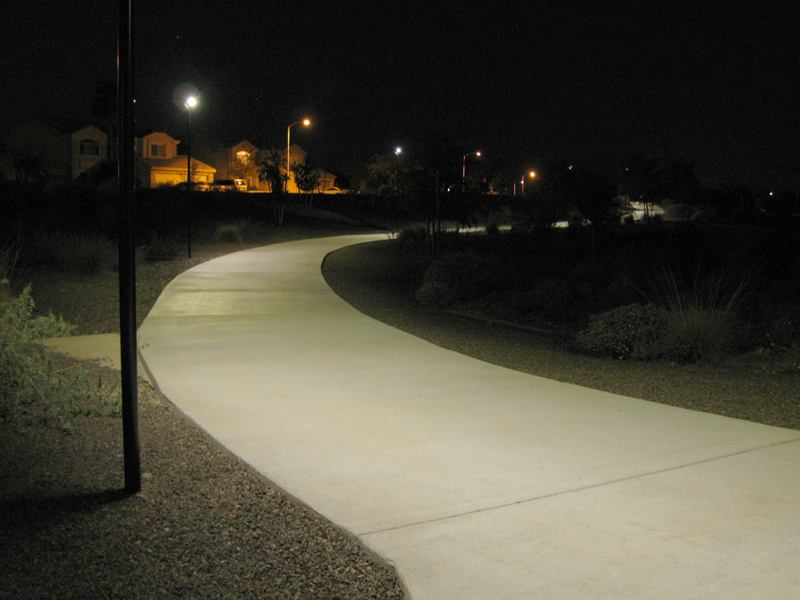 With community members calling for lighting to extend the useful operating hours of the trail system and ensure a safer environment, it needed to find a reliable and aesthetically pleasing lighting solution that wouldn’t disturb the existing infrastructure. 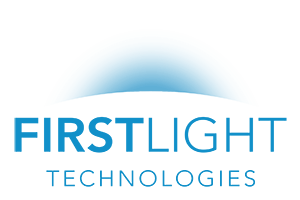 First Light Technologies was specified to the City of El Mirage by the nation’s premier planning and design consultants Kimley-Horn and supplied through local manufactured representative RC Lurie Co. Better Performance: The IPL provides lighting levels well within the IES recommended levels for pedestrian applications. The lights are also equipped with adaptive technology to adjust their output based on variations in weather or season to ensure reliability. Easier Install: Solar powered light removes the need for trenching for wires and the connection to the electrical grid. This is estimated to have saved the city over $110,000 in install costs alone. Less Disruption: Not requiring a trench in between all the fixtures meant that there was less remediation needed and less disruption for users of the park. Flood Proof: Being in a flood plain, solar will work regardless of the weather. Wired lighting risks damage and outages when flooding happens. Sustainable: The lights generate all the energy they need and are therefore emissions free. Components are sourced as locally as possible, including U.S. made steel and aluminum. Most components are recyclable at the end of their 20 year expected lifespan. We are so happy to see the impact the lights have made in making the park a more usable and inviting space for the community, some even calling it a source of community pride. We hope to work with El Mirage in the future on more projects so they can further leverage their average 296 days a year of sunshine.